Chinese fixed-asset investment growth in the first eight months slowed to the lowest pace since at least 1999 and infrastructure investment rose just 4.2%, the weakest expansion since the data series started in 2014. China’s economic momentum weakened again in August, presenting its policymakers with a test of nerve as they prepare for a potential new round of trade talks with their US counterparts. Fixed-asset investment growth in the first eight months slowed to the lowest pace since at least 1999 and infrastructure investment rose just 4.2%, the weakest expansion since the data series started in 2014. That indicates policies to expedite such spending are taking time to feed through, even as industrial output held up in August and retail sales quickened. A slowing economy gives China a weaker hand ahead of possible new trade talks the two sides are discussing, adding to the risk of a deeper slowdown should US President Donald Trump pull the trigger on tariffs on an additional $200bn of Chinese goods. Trump, this week, used Twitter to goad China about its supposed weakness, tweeting that its stock market slump showed it’s under pressure to strike a deal. "This is not a desirable position to be in heading into further trade talks with the US," said Katrina Ell, an economist at Moody’s Analytics in Sydney. "China’s August activity data confirm the economy is on an entrenched slowing path that is perhaps losing speed a little quicker than policymakers desired." Investment rose 5.3% year-on-year in the first eight months, compared with an estimated 5.6% and 5.5% the previous month. August industrial production expanded 6.1%, meeting estimates. Retail sales expanded 9% last month from a year earlier, accelerating from an 8.8% pace in July. Infrastructure and fixed asset investment are unlikely to pick up soon, although it may stabilize in the next few months, according to statistics bureau spokesman Mao Shengyong. The government is boosting investment in western regions and rural China, and that will help support infrastructure investment, he said at a briefing after the data was released. The surveyed jobless rate in urban areas declined to 5%, versus 5.1% in July. The output of computer and communication gadgets surged 17.1% from a year earlier, hinting at front-loading by exporters anticipating more tariffs from the US. The data indicate that policies the government has announced in recent months to spur investment have yet to take root. Credit data in August were stronger than expected overall, although the growth in bank lending is still slowing due to the effects of the campaign to cut leverage. "The Chinese economy overall is still slowing," said Lu Ting, chief China economist at Nomura International Ltd. in Hong Kong. "The slowdown could get worse in the next couple of months. 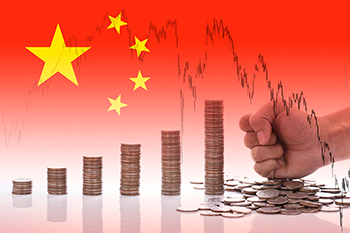 We expect an escalation of US-China trade tensions and the fallout of some emerging market economies to weigh on China’s export growth." What do Bloomberg’s economists have to say? China’s economic activity was broadly stable in August, with activity readings showing the economy has avoided a sharp deceleration for now, Bloomberg Economics Chang Shu and Qian Wan wrote in a note. However, with the funding shortage in the economy still acute and no end in sight for the trade war, the government will stop spending on infrastructure and the central bank will act to facilitate lending. The US and Chinese governments are working out the details of a new round of trade talks, raising hopes that they may be able to ease tensions and avoid further escalation of the trade war. China has received an invitation and is working on the details with the US, commerce ministry spokesman Gao Feng said at a regular briefing in Beijing Thursday. That invite was recently extended by senior officials led by Treasury Secretary Steven Mnuchin, according to three people familiar with the matter, who spoke on condition of anonymity. Differences between the two sides remain vast and trust is limited after the collapse of earlier talks in May. Chinese state media on Friday warned the nation against expecting a quick resolution to its trade dispute with the US, as there have been no signs that President Trump has changed his thinking. “We are under no pressure to make a deal with China, they are under pressure to make a deal with us,” Trump said on Twitter on Thursday. There may be better news ahead for China’s policymakers, said Liu Ligang, chief China economist at Citigroup Inc. in Hong Kong. His tally of provincial debt issuance indicates surges in July and August, suggesting more positive activity data in September and beyond, he said. "In addition, some provincial governments led by Guangdong have started to initiate their own policies to lower corporate operating costs and regain competitiveness in light of US tariff levies," Liu said.